Love them or hate them, there's no denying that the Apple AirPods have soared in popularity over the last couple of years – just take a look around on your daily commute, and you're bound to see a plethora of the true wireless earbuds sticking out of your fellow commuters' ears. Now the continued popularity of AirPods can be confirmed by cold, hard data. According to a report by Counterpoint Research, Apple's AirPods are still the most popular true wireless earbud on the market. This is in spite of increased competition from the likes of the Jabra Elite 65Ts and the new Samsung Galaxy Buds. The report claims that "the size of the global market for true wireless hearables stood at 12.5 million units in Q4 2018", and that "Apple was the clear leader with a 60% market share". After the Apple AirPods, the top ten best-selling true wireless buds included the "Jabra Elite Active 65T, Samsung Gear IconX, and Bose SoundSport Frees", but it appears no other brand came close to Apple's enormous market share. Apple recently updated the AirPods to bring us the Apple AirPods (2019), which feature a wireless charging case, faster pairing times, and a hands-free 'Hey Siri" feature. It was previously thought that Apple would announce a brand new version of the AirPods, the AirPods 2, this year, but having just updated the originals, we probably won't see the AirPods 2 until 2020. 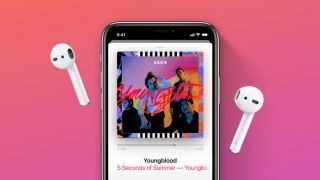 Apple AirPods (2019) vs Apple AirPods: what's the difference?